1) Clementine Hunter (1887-1988) was a self-taught African-American visual artist whose work Wilson was first introduced to on a family trip from Waco, TX to Louisiana where Hunter lived and worked. Wilson was 14 at the time. Hunter, who was born on Hidden Hill cotton plantation near Cloutierville, LA, did not begin painting until she was in her mid-fifties. Her work, full of vibrant color, chronicled the side of plantation life that was “over the fence and across the road.” (See attached biography). 3) The performers are Cornelius Bethea, Nat Chandler, Carla Duren, Francesca Harper, Karma Mayet Johnson, Jennifer Nikki Kidwell, Josette Newsam-Marchak, Robert Osborne, Charles E. Wallace and Darynn Zimmer with Sheryl Sutton. The musicians are Robert Burke, Fred Cash, Juliette Jones, Jason Walker and Adam Widoff. At Melrose, Hunter toiled in the cotton fields and pecan groves for most of her youth and then worked as a domestic servant in the plantation’s “Big House” when she approached middle age. Between 1917 and 1948, the plantation was owned and operated by Carmelite “Cammie” Garret Henry. Strongly influenced by the Arts-and-Crafts Movement of the early 20th century, Henry developed Melrose into a haven for artists and writers, who were invited to live in the outbuildings and work for extended periods on the plantation grounds. Sometime in the late 1930s, after age 50, Hunter began painting with the leftover brushes and oils discarded by New Orleans artist Alberta Kinsey, a frequent Melrose visitor. Without formal training, Hunter began painting her memories. In time, her colorful works illuminated the side of plantation life that was “over the fence and across the road.” Her paintings are recognized as visual narratives, telling the story of the African-American and Creole people who lived and worked on and around the plantation until their labor was replaced by mechanization after World War II. Hunter continued to paint until a few days before her death on January 1, 1988, at the age of 101. ROBERT WILSON was described by the New York Times as “a towering figure in the world of experimental theater.” Wilson, born in 1941 in Waco Texas, is among the world’s foremost theater and visual artists. His works for the stage unconventionally integrate a wide variety of artistic media, including dance, movement, lighting, sculpture, music and text. His images are aesthetically striking and emotionally charged, and his productions have earned the acclaim of audiences and critics worldwide. BERNICE JOHNSON REAGON has been a major cultural voice for freedom and justice for more than a half-century. As artist, singer/composer/producer, as author, as a cultural historian with a specialty in the history of African-American culture; and as a teacher: in live solo presentations, in the classroom, as a museum curator, and in her documentary productions in radio, films and audio recording, Reagon has helped to shape the field of public history. Born in southwest Georgia, the third of eight children, her parents Rev Jesse and Beatrice Johnson grounded their family with a linked partnership of home, school and church. While in college during the early 1960s, Reagon’s activism as a student leader during the Albany civil rights movement resulted in her being jailed and expelled from school. Her singing power came to attention as a song leader in the Albany, Georgia mass meetings; she joined the first national tour of the SNCC Freedom Singers, organized by Cordell H. Reagon. Completing her studies at Spelman College, with graduate work at Howard University, she formed the internationally renowned African-American women’s a cappella ensemble, Sweet Honey in the Rock. She led this group for 30 years until retirement in early 2004. She is curator emeritus at the Smithsonian National Museum of American History and professor emeritus of history at American University. Reagon’s work as a scholar, producer and score composer includes a number of documentary projects: Reagon was music consultant to the Emmy Award-winning series “Eyes on the Prize” (Blackside/PBS); “We Shall Overcome” (Ginger Productions), and conceptual producer and host for Peabody Award-winning radio series, “Wade in the Water: African American Sacred Music History” (National Public Radio and the Smithsonian Institution). Reagon composed the score for Peabody Award-winning film series on slavery: “Africans in America”(PBS/WGBH-TV), and is composer and librettist for Robert Wilson’s opera, “The Temptation of St. Anthony,” (2003 premiere in Germany). Reagon, with her daughter and strongest collaborator, composer/bandleader/singer Toshi Reagon, and jazz pianist/composer Jeri Allen, composed the score for HBO’s Peabody Award-winning film “Beah: A Black Woman Speaks,” produced by Jonathan Demme and Lisa Gay Hamilton. Reagon has been the recipient of a NYFA award for Music Composition and The Black Lily Music and Film Festival Award for Outstanding Performance. She is a National Women’s History Month Honoree, and the recipient of OutMusic’s Heritage Award (2010), and the Stonewall Honors Award (2012). JACQUELINE WOODSON is a three-time Newbery Honor-winner – in 2006 for “Show Way;” in 2008 for “Feathers;” and in 2009 for “After Tupac and D Foster.” “Hush” and “Locomotion” were both National Book Award finalists. Woodson has been recognized by the Coretta Scott King Book Awards Committee for “I Hadn’t Meant to Tell You This,” “From the Notebooks of Melanin Sun,” and “Locomotion,” all Coretta Scott King Honor Books. “From the Notebooks of Melanin Sun” and “I Hadn’t Meant to Tell You This” both received Jane Addams Peace Award Honors, and Woodson’s highly-acclaimed novel “Miracle’s Boys” won the Coretta Scott King Award and the Los Angeles Times Book Prize and aired as a mini-series directed by Spike Lee, among others. Her work has appeared on numerous Best Book and Notable lists. 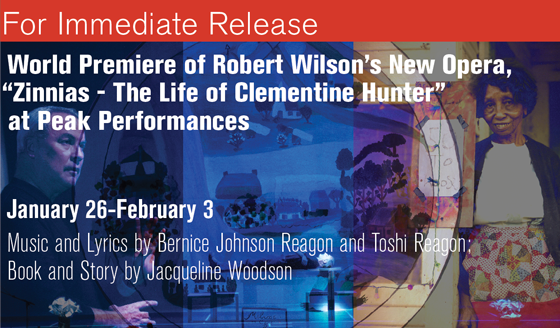 The World Premiere of “Zinnias - The Life of Clementine Hunter” was produced by Peak Performances at Montclair State University in January 2013. “Zinnias - The Life of Clementine Hunter” is made possible in part by a grant from the Association of Performing Arts Presenters Creative Campus Innovations Grant Program, funded by the Doris Duke Charitable Foundation. Programs in this Peak Performances season are made possible in part by funds from the Association of Performing Arts Presenters; the National Endowment for the Arts; the New Jersey State Council on the Arts/Dept. of State, a partner agency of the National Endowment for the Arts; Discover Jersey Arts; New England Foundation for the Arts; Alison and James T. Cirenza; and The Honorable Mary Mochary. Front page collage designed by Michael Bonfiglio/Ellen Jacobs Associates. 1) Robert Wilson shot by Lesley Leslie-Spinks. 2) Zinnias workshop shot by Stephanie Berger. 3) Clementine Hunter shot by Thomas Whitehead.